We will be heading to Maryland for the Baltimore Comic-Con this weekend, Saturday, August 20 and Sunday, August 21! 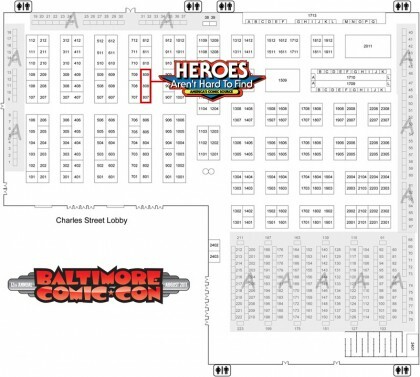 You can find us at the booths 807-809 selling great comics and letting folks know what we have planned for HeroesCon 2012! Attendees of the Baltimore Comic-Con will be the first to hear about some our great guests the 2012 30th Anniversary show! Shelton will be bringing some great Silver and Golden Age books! Also, Seth has been working hard at creating a newly expanded, alphanumerically organized convention stock of modern comics. And to top it all off, if space allows, we will have some great bargain boxes! Here’s where where you can find us! If you’re looking for us closer to home, come see us at the Raleigh Comic Book show next Sunday, August 28th. We’ll be bringing talented comic creators Chris Brunner and Bridgit Scheide along with us. More details here. ← HEROES :: BEST COMIC BOOK SHOP IN CHARLOTTE :: THANK YOU!